I’m sailing on this expedition as a structural geologist, and as such my main interest is in how rocks deform (deform means to alter the size or the shape of the rocks). Slow slip is therefore an exciting topic – how do rocks slip in such a way that deformation is faster than plate boundary averages, but slower than earthquakes? I work on how slow slip events actually happen – what materials accommodate slow slip, by what physical mechanism, and what is the geometry of a slow slip zone? I am hoping that what we see in the cores from the Hikurangi margin will help answer these questions. Normally, I look at rocks on land and map the extent of faults and the rocks they occur in. With this approach, we know the rocks well in a two-dimensional map view of the Earth’s surface and extrapolate what happens into the ground. We can directly observe deformation structures, but we have to infer what happened to make them. Working on a scientific drillship is a very different situation because in the ocean you can’t walk on the seafloor and make maps. We sample hundreds of metres of core – a linear transect that shows how rock types and their deformation structures vary with depth below the sea floor. We rely on other data sets, such as seismic surveys, to put this depth-section into three-dimensional context. We can say a lot from drilling that we cannot say from other data. Seismic data allow us to interpret the geometry of structures, but not exactly what the rocks are, nor what the structures look like at scales less than tens of metres. In a drillcore, we can directly observe the rocks, and get microscale resolution of how the rocks have deformed in the sections we recover – this is a really exciting addition to what we can tell from remote geophysical data. We know that earthquakes are really localized, and typically occur on fault ‘planes’ that are very sharp – accommodating slip within millimetres to centimetres of deformed rock. On the other hand, we also know that the other end-member – slow and steady plate boundary creep – can be distributed over zones that are hundreds of metres wide. But slow slip is slower than an earthquake and faster than the fingernail-growth pace of plate boundaries. So, is slow slip localized to a plane, or is it distributed across a wide zone of rock? Does it look like a slow but localised earthquake, or do we have accelerated creep across some wider, weak layer of rocks? We can look at slow slip from a distance, and say that slip is occurring slower than an earthquake, but faster than steady plate boundary deformation. It is, however, only through drilling projects that we can directly sample and examine the rocks that accommodate slow slip, and the fault zones in which slow slip may be occurring. 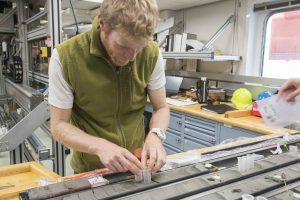 For geologists who try to understand how rocks behave during deformation, expeditions like IODP Expedition 375 are unique opportunities to obtain information from an actively deforming subduction margin – a place where we know the active behaviour, but not the materials that accommodate it, or the structures left behind. 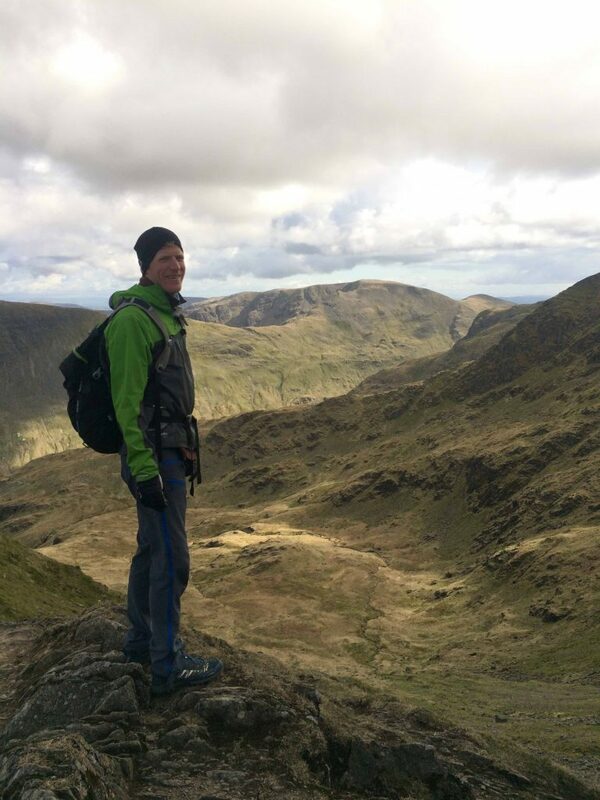 Åke is a Reader in Structural Geology at Cardiff University, Wales, United Kingdom. He is, however, originally from Norway, where he grew up, and still speaks Norwegian on the phone to his family and remembers how to cross country ski. He went to high school at the Li Po Chun United World College of Hong Kong, and did his undergraduate studies at the University of Cape Town, where he went back as a Lecturer from 2010 to 2014. His connection to New Zealand dates back to 2006-2010, when he lived in Dunedin and did his PhD at the University of Otago, and also spent some time at GNS Science in Lower Hutt. 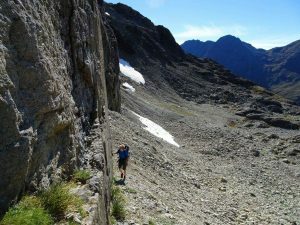 When there’s not much snow, he goes climbing and running to compensate for the lack of skiing – eight weeks on a ship is pushing the limits of how long he can have fun on a treadmill.